Oh, friends, do I love holiday food. I love it all—the starchy potatoes, the delicious meats, and oh, those sweets. All of the cookies and candies that come out in November and seem to be ever-present into the New Year. But, yeesh. Wouldn’t it be nice if we could find some ways to celebrate together that DON’T involve overeating and unhealthy options? Here are 6 things you can try this holiday season that are fun, and won’t leave you feeling gross. 1. Volunteer together. For years now, the adults in my family have adopted a large family for the holidays, providing food, presents, and clothing to folks who might otherwise go without. I have to say, the gifts requested are often so humbling (new pots and pans, pretty candles), and they certainly put the holidays in perspective for me every year. As an added bonus, going with my kids to buy someone else’s Christmas has all sorts of benefits for them as well, from increasing their empathy to seeing each other in a different light. Perhaps volunteering together might be just what your family needs this holiday season as well. 2. Movie Night! I love Holiday Movies! My family has a tradition that there are some movies we simply must watch in November and December (some holiday-themed, some not so much). So one of the things that I love to do is let everyone pick a movie from our list and we binge-watch them over a couple of evenings. Yes, there is almost certainly popcorn and cocoa involved, but the food isn’t the centerpiece of the event, and anyone can skip the snacking. This is another great activity that can involve all of the generations in your household, from kids’ cartoons to black-and-white classics. 3. Make Decorations. If you’ve read previous posts of mine, you probably know that I’m not overly crafty. But there are some holiday decorations that even I can make (and so can you!). 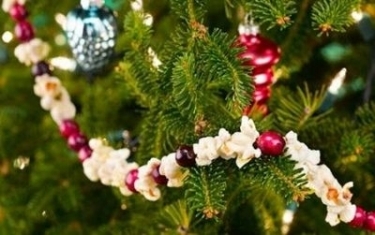 Something as simple as stringing cranberries and popcorn to hang on the tree or mantle can be a great group activity for anyone old enough not to injure themselves with the needle. And if you eat some of the popcorn? No worries! 4. Go on a Winter Nature Walk. I know we typically think of taking walks during the other three seasons, but there is nature to be seen during the winter months as well. Depending on your climate, you can go hunting for pinecones or seed pods, or maybe some of the last few leaves of Autumn. If you’d like to get crafty with your winter walk finds, look also for dried grasses and evergreen boughs that you can trim and bring home for table or mantle décor. Walking with little people? Come up with a “Treasure Hunt” list to keep them entertained! 6. Make a List. Nothing says that you have to be the only one who establishes holiday traditions in your household. Particularly as your kids get older, they might want to participate in deciding just what you do each year. 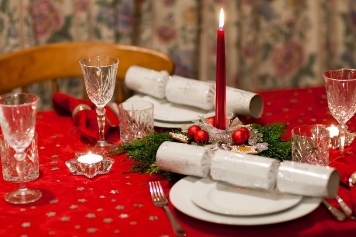 Try having everyone in the house make a list: “Hannukah (or Christmas) just wouldn’t be the same without these 5 things.” Use that list to help decide together what you want to keep doing, and what you might be able to let go of. Oct 29 Listen to my Interview!